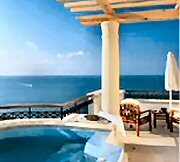 Stay in one of my pick of the best luxury villas Protaras for a fabulous beach holiday in Cyprus. Protaras is a hugely popular beach lovers resort situated on the far east of Cyprus offering everything a family or romantic couple could want for a holiday: the three S's - sun, sea and sand, plus a huge choice of shops, restaurants, pretty tavernas and bars. I don't get over that way too often, but when I do, I head for the crystal clear waters of Fig Tree bay, the main reason why so many people choose villas Protaras, as it is arguably the best beach in Cyprus. 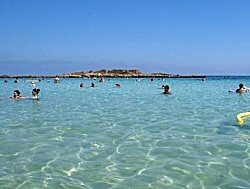 Fig Tree Bay is surrounded by palm trees which creates an idylic atmosphere. You can enjoy a meal right on the beach and, if the beach gets too full in high summer, head over to Konnos Bay nearby for a great range of watersports. Here are my recommendations for your luxury villa holiday in Protaras near Larnaca. Unlike other villa areas in Cyprus, where a car is essential to get to shops and restaurants, many of these villas Protaras do not require a car as they are within walking distance of all amenties. Tip: So look for "car optional" in the description if you want to save some money! All my Protaras villas are available through my high quality villa partner, so you can be sure of exceptionally high standards. Click on the blue links for availability, additional photographs and villa information and to book online. Sunnyside From £762 per week. This 3 bed 2 bathroom villa is perfect for families and couples wanting to be close to amenities but not wanting to always drive. It has a lovely 8 x 4 pool and outside pergola for lunches in the shade or stroll and is located in a quiet area with beautiful views of Ayios Elias. The villa offers free WiFi and free A/C. The centre of Protaras and Fig Tree bay is only 15 mins walk with plenty of bars and restaurants. Another highly popular villa so book early to avoid disappointment. Villa Greko Mare 17 From £1191 per week. Car optional Special offers available. Well located with in a short walk of a sandy beach this beautifully presented 3 bed, 2 bathroom villa sleeps 6, is stylishly furnished throughout and has FREE air conditioning in the lounge and bedrooms. Walls have been painted in a mixture of pastels and brights, so no white box interior here! Free timer-controlled A/C. Outside, there is a 8x4m kidney-shaped pool, perfect for cooling down from the midday sun, whilst a shady verandah offers comfortable seating to relax and enjoy alfresco dining. The centre of Protaras is a short drive away, where you will find streets lined with a great selection of restaurants, bars and shops. For guests wanting to keep in touch on line, a pay as you go dongle is available for those bringing their laptop or tablet. Villa Constantina From only £691 per week. This 2 bed 1 bathroom villa is perfect for couples or small families and is within walking distance of the popular Pernera area of villas Protaras with its own local bars and restaurants and the lovely fishing harbour. Inside, the property is attractively furnished throughout in a modern contemporary style, with a light and airy décor, while outside guests can relax by the private pool on the spacious sun terrace where al fresco meals can be enjoyed under the pergola covered eating area. One of the best value villas Protaras you can find especially when it has FREE WiFi, FREE A/C and an Xbox! 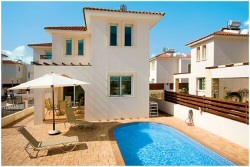 Holiday villas in the luxurious Aphrodite Hills resort.